My Southern Sparkle: Ready for Fall...yep, ready! 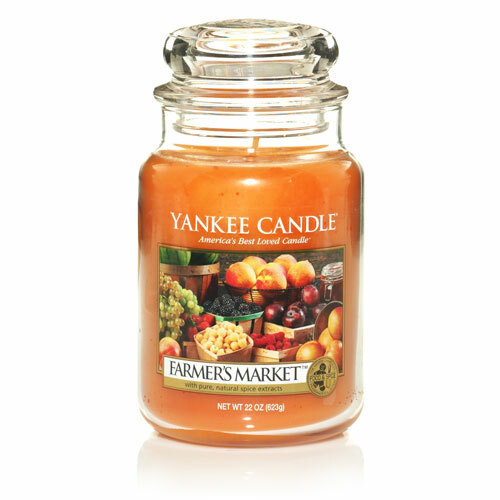 This morning I had no desire for fall, this afternoon I had no desire for fall, but this evening when I was at the mall and smelled Yankee Candle's new scent, Farmer's Market... I got ready. Yes, right then and there, I got ready for fall in all its glory. I always start off September using Yankee Candle's MacIntosh Spice. It has that crisp apple scent that reminds me of apple orchards and usually prompts a trip the mountains to pick some fresh off the tree. Then later in the fall, I will switch to a pumpkin scent which gets me all excited for the holidays. Farmer's Market combines both of those amazing scents for one treat that will carry straight through the season! "Autumn's freshest bounty ... sweet berries, juicy apples, succulent peaches and warm spices." I have found my new favorite scent! Come on fall, I am ready for ya!!! **this is just another unsolicited, and uncompensated opinion! Ooo, I love fall scented candles. It's funny that you mention Fall because today as I was looking around at my neutral but summery/beachy palette and thought how nice it will be to have the coziness of fall-cooler weather, sweaters and hot cups of mulled cider. Thanks for finding me on the blog hop and stopping by to say hello! :) I'm glad I get to visit you here too! I will definitely have to look for this candle! Fall is one of my favorite seasons! Oh I am SOOOO beyond ready for fall! South GA humidity puts a damper on even the best moods! Summer has always been my favorite season. Always.